testifies at his nomination hearing in Washington, Nov. 17, 2015. 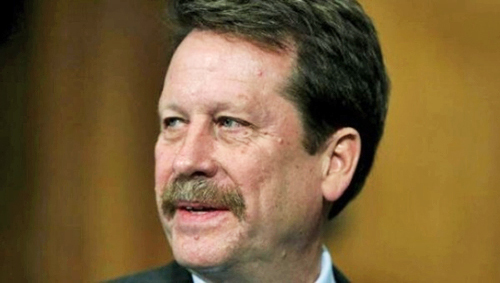 The nomination of Robert Califf to head the Food and Drug Administration (FDA) demonstrates once again that the pharmaceutical industry has immense influence in federal government. The FDA, which claims to 'protect us' from bad foods and drugs, is now run by a person who has reaped hundreds of thousands of dollars through ties to 23 drug companies. Big Pharma has a very special privilege in the U.S., which is one of only two countries that allow direct-to-consumer marketing of its patented products. Between this and its profit-sharing relationship with doctors, the industry has a nation hooked on legal drugs such as opioids which are killing people by the thousands and leading to a massive heroin epidemic. To secure the approval of new patented products, Big Pharma will not hesitate to abandon scientific integrity. ...were just caught hiding critical laboratory data from one of the world's top medical journals. 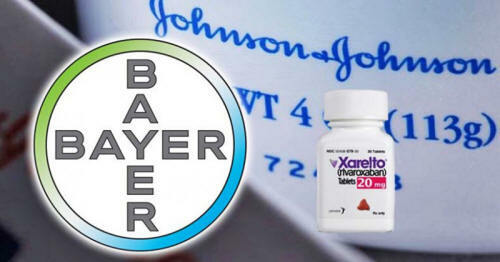 The missing data is at the heart of a lawsuit being filed against the companies on behalf of 5,000 patients and their families who say they were harmed by the drug Xarelto, including 500 who died. "Did two major pharmaceutical companies, in an effort to protect their blockbuster drug, mislead editors at one of the world's most prestigious medical journals? Lawyers for patients suing Johnson & Johnson and Bayer over the safety of the anti-clotting drug Xarelto say the answer is yes, claiming that a letter published in The New England Journal of Medicine and written primarily by researchers at Duke University left out critical laboratory data. They claim the companies were complicit by staying silent, helping deceive the editors while the companies were in the midst of providing the very same data to regulators in the United States and Europe." The pharma companies have a lot at stake, as the patented drug, which replaces an older drug with an expired patent, brought $2 billion in U.S. sales last year alone. The case centers on a blood-testing device used during a clinical trial that malfunctioned, which produced faulty results that could have led doctors to favor the new drug Xarelto to the older one being used for comparison. The trial involved more than 14,000 patients and was key to securing regulatory approval. "It just feels like it's a real ethical breach," said Dr. Lisa Schwartz, a professor of medicine at Dartmouth, of the failure to include the lab data in the letter. "If you know the direct answer to this question, then how can you not provide it to be able to give insight?" Duke Clinical Research Institute, which was hired by Johnson & Johnson and Bayer to carry out the trial, was even asked directly by a peer reviewer if the lab data in question existed. In fact, there was data from test results done at a central laboratory that would have been a better way to evaluate the blood-testing device. "essentially guess which groups of patients were more likely to be affected by the malfunctioning device." Top editors at The New England Journal of Medicine, as well as Duke and pharma company spokesmen, say problems with the device did not change the trial's results. However, some experts are not so easily convinced. "Several researchers said they were surprised that Duke and the editors at the journal did not see value in comparing the lab data, especially since Bayer and Johnson & Johnson have submitted such information to regulators in Europe and the United States." "I think it's always important to make sure that you have all the information to answer the scientific question before publication," said Dr. Rita F. Redberg, a cardiologist who is also editor of the medical journal JAMA Internal Medicine. Dr. Steven Nissen, a cardiologist at the Cleveland Clinic, was one of two members of an advisory panel to the FDA who voted against Xarelto. "there is no way anybody can tell you what would have happened in the trial." Duke has agreed to conduct an analysis of data from the central laboratory, but something seems fishy. "In a previous statement, Duke said it had conducted its research separately from the two companies. But this fall, Bayer submitted an analysis to the European Medicines Agency that was nearly identical to the approach used by the Duke researchers, comparing the outcomes of patients who had specific medical conditions with outcomes of those who did not. And the legal document filed last week cites a document obtained from one of the companies that describes the peer-review process." As the investigation deepens, we could see similarities to the notorious 2005 pharma scandal where Merck deleted data showing heart attacks before submitting the trial manuscript. After this revelation, the drug Vioxx was taken off the market. This incident highlights the impunity large corporations, who are backed by the government, enjoy. Had the average citizen negligently caused the deaths of hundreds of people, they would be the most notorious serial killer of all time.